Glebe boss Jason Wilmont knows it's a massive week for the club.INBM36-15 016SC. It’s going to be a massive week for Glebe Rangers. 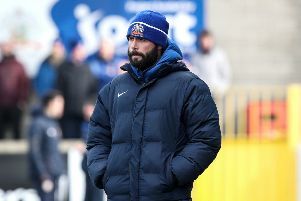 Jason Wilmont’s side are clinging on to Championship Two survival knowing they will need a favour from Sport and Leisure Swifts to stay up. After back-to-back wins last Friday night’s 4-1 defeat at Newington put a dent in the Glebe’s survival hopes. They now sit one place above the drop zone with one game to play. The problem for Glebe is Newington have two games to play, and two wins for the North Belfast side this week would mean big trouble for the Ballymoney side. “Unfortunately it’s out of our hands at the minute,” Wilmont told Times Sport. “It’s not the scenario we would have wanted, but we just have to get on with it. “Everything hinges on Newington’s game at Sport and Leisure on Thursday night. “If Sport and Leisure win Newington would be two points behind us with one game left each. “That would mean a win at home to Dollingstown this Saturday would keep us safe. “A win for Newington though would drop us into the bottom five and leave us hoping for Wakehurst to beat them on Saturday. “Unfortunately we will be without Chad Dobbin, who is injured, and Willie Beckett, who is unavailable. “Whatever happens we will give our all in the final game as we always do, and I’d ask the fans to get out in force and get behind us on Saturday. “We just have to put last Friday night out of our heads. We don’t seem to play well on the 3G pitches. “We still had chances to get something out of the game, but we didn’t take them. Unfortunately we got punished by them.